"Your silhouette is an outrage to beautiful materials". As part of a series of articles on theatre in translation, Diana Damian Martin explores the complexities of translating NDiaye's text 'Les Serpents', a mythological exploration of colonialism. In Les Serpents, the cornfield trembles, a ghost lingers yet is not seen, and three generations of women become complicit in a cycle of abuse and sacrifice. The house around which the play centres is always shape-shifting, neither real nor symbolic. In the almost baroque, fractured dialogues, we hear of the children crying, the children not growing, the children who are gone. And neither them, nor the cornfield or the house, are here, and all we have are three female bodies speaking of histories without continuity, trying to understand their own loyalties and plotting roots on soiled lands. Les Serpents is translated by scholar Kelina Gotman, and directed by Daniel Goldman for a staged reading that took place at The Gate Theatre on 1st July. It is the second project for the first stage of the Arts and Humanities Research Council –funded research project Translation, Adaptation, Otherness: ‘Foregnisation in Theatre Practice’. Foreignisation is a term that emerged in translation studies, defined by scholar Lawrence Venuti in opposition to domestication, critiqued as a mode of stifling cultural difference through familiarisation. The project situates the debate in the context of theatre, asking how and whether such an approach requires a more complex examination, and foregrounding the processes of negotiation, practical and ideological, underpinning translation and adaptation for the stage. It concentrates on three of the most spoken foreign languages in the UK: Polish, French and Spanish, and contextualises the research in relation to two problems: one is a lack of diversity of representation in British theatre, and the other, the necessity of intercultural dialogue in an increasingly multicultural landscape. To think of Les Serpents in this context, then, is to understand the political and cultural ecologies that have shaped it, both in regards to the specificity of its dramatic narrative, and the more overly political resonances: the house, the Bastille Day celebrations, the potential symbolisms of the three characters. But it is also to understand it in a lineage of French theatre that emerges from Symbolism and continental Modernism; a theatre concerned with ambiguity, with language as much as with theatricality, with conflict and affective expression. NDiaye weaves the domestic and the mythical to examine the social and the political, without setting mirrors for our own reflections. Les Serpents is constantly undoing and destroying its own narrative, and dramatically, it shifts its dramaturgy in a constantly unsettled game. Whilst thematically, it might share some of the concerns of NDiaye’s literary works, such as family, forgiveness, shame or sacrifice, it is undoubtedly an equally politicised reflection on traumas of the past seen through the experiences of three women. Born of a French mother and Senegalese father, NDiaye grew up in the Paris suburbs before recently relocating to Berlin. She wrote Les Serpents in 2004, co-wrote the film White Material with Claire Denis in 2009, and Ladivine, her Man-Booker shortlisted novel, was published in 2013, with the English translation coming out this year. NDiaye will most likely have made her name in the UK as a Man Booker Prize finalist, and almost certainly through her literary, rather than dramatic work. Although equally concerned with power structures and their social implications, NDiaye’s theatre work operates with mythological resonance, exploring particular social narratives and their political contexts. The child, at the heart of Les Serpents, is a familiar dramatic trope, as is the process of colonisation itself, embodied and psychological. Les Serpents seems an apt example of the kinds of questions asked by Foreignisation, for the ways in which it tackles alienation, sacrifice and abuse on a domestic, rather than overtly political level; it tempts domestication because its cultural specificity is so embedded in several layers and theatrical devices, very much working away from known paradigms: naturalism or postdramatic, for example. Les Serpents is neither; but the ambiguities it maintains, whilst translated with sensitivity and focus by Gotman, are easily erased. This becomes an ethical, as much as a cultural problem, one battled out in the rehearsal room and beyond. The director, Daniel Goldman, has a week to stage the play; he’s working alongside Gotman, the translator, with Margherita Laera, the project’s Principal Investigator, also present in the rehearsal room. When I come in, early in the week, I interrupt a conversation around the role of mythology in the play; parallels are made between the house and the underworld, the Goddess of Vipers, Demeter and Persephone all come up too. 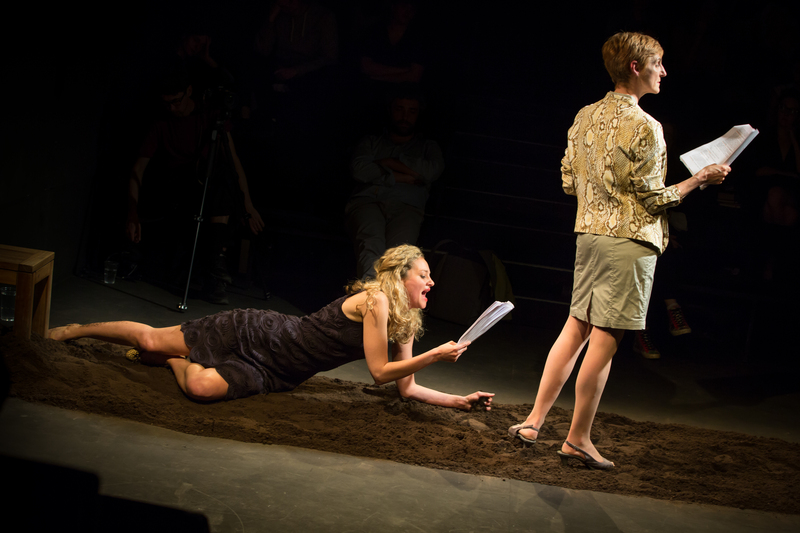 If the mythological resonances of the play are hard to argue, their role is much more fluid. The cast considers these carefully, scribbling notes on the script. Earlier in the day, they’d gone through an exercise in which they had to pick out dialogues or directions in the play that might help them map out relationships to each other, and to the house. There’s a clear struggle in the room, mapped out against several conflicts. It’s been a tricky start to the week, with an actor having to drop out, tensions rising as Friday is nearing, and there’s still lots of script work to do. Goldman is intent on carving out a narrative logic to situate the actors, to give them and the audience something clear to hold on to. Gotman and Laera act as a joint dramaturgical team, foregrounding the identity of the play itself, kicking the ambiguities back in. I join them later in the week, when actors are up on their feet, and there’s a dual process of spatialising the play, and figuring out an approach to the acting. Goldman is inviting the actors to play a game with the audience, whilst Gotman is signalling that the house is representational, but not necessarily actual; she suggests that it is pivot point of the actual conflict, rather than the seeming tensions between the three women. Goldman discusses super-objectives to the actors, playing with where the audience might reside in the meaning-making processes; he’s not a fan of ambiguity, and wants to make this as accessible as possible. A discussion about language ensues: each actor has a different natural accent; Madame Diss is certainly anglicised, but this is for the sake of positoing for the audience. And there it is, the tension, it’s back. It would seem reductive to simply ascribe these conversations, surrounding linguistic, dramatic and directorial choices, to either foreignisation or domestication. Theatre doesn’t deal well with these kinds of binaries, and the rehearsal room is always a space of negotiation, collaborative or not. In some ways, certain strategies that might be seen to domesticate serve as a mode of familiarisation, whilst others are more overtly resisted by the cultural identity of the play. I ask Goldman about the challenge of staging a play where ambiguity is a dramaturgical device, and he insists that the approach needs to prioritise the audience, to give them a way in. His answer to the question of staging is to take search for the play’s internal logic, although Les Serpents certainly poses a challenge to that, because it simply doesn’t quite operate in that way. Of course, particularly as for the actors, there is nothing to hold on to per se- that’s solely the director’s remit, to give them ways of navigating, of holding on, without literalising a play that doesn’t speak that language. But it’s hard not to literalise, to keep that ambiguity, that foreignisation, at play in this manner. There is something underpinning the tensions in the rehearsal room, and that has to do with a politics of access. Goldman, in his approach at locating a particular narrative and spatial logic to the play, is also resisting its difference, without necessarily authoring that resistance. The concern has to do with accessibility, with a fear that in its current language and otherness, Les Serpents will keep people out. Goldman reminds me that his approach is to be mindful to an audience, but others in the room welcome uncertainity as a space in which the audience can find meaning, and work hard for it. Staging difference and difficulty is challenging, and assumes a particular attitude that isn’t afraid of inviting an audience to work hard. It’s the parameters of that hardship are under discussion here, and that underpins much of the debates in the rehearsal room for Les Serpents. It’s fair to say that all theatrical systems make assumptions about both representational power and processes that enable that to happen. If the rehearsal room is a space for decision-making, it is also a place for ethics, and this strikes me as a particularly ethical question: what demands are made on an audience, and who can speak for them? What does it mean, to compromise a cultural identity in favour of another? What do we need to acknowledge about our current systems of representation to enable otherness to exist without fetishisation? And what kind of information do we need to have to be able to do so? When speaking about the ways in which German theatres of the time approached performing plays of other periods, Brecht critiqued their annihilation of distance, their filing the gap, their ‘glossing over the differences.’ This was the 1960s, in the midst of a tense political climate that divided Germany, with the scars of the second World War very much present; no surprise, the extent to which history’s role was being re-examined, and re-conceptualised in theatre, divided between necessary acts of remembrance and confrontation. These discussions signal to me a very noisy, fragmented ecology of talking about foreign theatre in UK, which increasingly, both culturally and politically, wants to have the best of both worlds: leave the EU, but entirely on its own terms; maintain a multicultural workforce only to the extent to which it is economically profitable; make visible cultural difference through strategic, but misguided cultural policy that makes a spectacle of otherness, a pure exercise in visibility. This is a very problematic way of talking about several issues: the issue of translation of dramatic texts; the issue of adaptation and direction of foreign dramatic texts; the issue of domestication; the issue of visibility of those processes, and their centrality in different institutional and artistic agendas. And to top that off, the assumption that there is only one way of theatre doing politics, or doing cultural difference: the British way. Whilst the political and cultural changes of Europe that Brecht spoke of might have subsided, we’re experiencing a different drift; interculturalism is not just a liberal fancy, it’s a necessary direction for cultural practice because there are few infrastructures that support giving visibility to the multiple narratives and identities that are now established in Britain. And secondary to that, the othering of European theatre on the basis of its continentalism, which is a prevailing attitude, despite those who seek to work differently, suggests that Britain is still, at times, reluctant to confronting difference – difference in ways of working, in ways of thinking about theatre, as much as difference as an aesthetic, liberal problem.